Transport sheet materials for construction or manufacturing with Mobile Sheet Material Racks (MMR) from BHS. These heavy-duty steel carts provide bulk storage for plywood, drywall, stone, and even sheet metal. Sheets stand vertically within the frame, held in place by powder-coated steel crossbars during storage or transportation. When at rest, the MMR secures materials that might otherwise fall, bend, or slide to the ground, causing stock losses. The vertical-storage design of these racks reduces the unit’s overall footprint, preserving valuable floor space. It also simplifies the process of organizing and picking from sheet material stores. Easy-rolling phenolic casters allow users to move bulk quantities of materials to production lines or around the job site. Save time during construction projects by safely carrying an entire job’s worth of materials in a single trip. For permanent sheet material storage at a single location, choose fixed Sheet Material Racks from BHS. 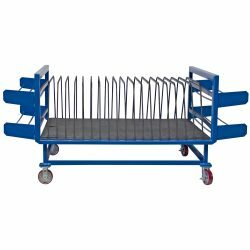 Mobile Sheet Material Racks provide the same dependable service, but with the flexibility and portability of a cart. To learn more about BHS solutions for handling sheet materials, call the sales team at 1.800.BHS.9500.